Apple watch: It creates negative externalities. 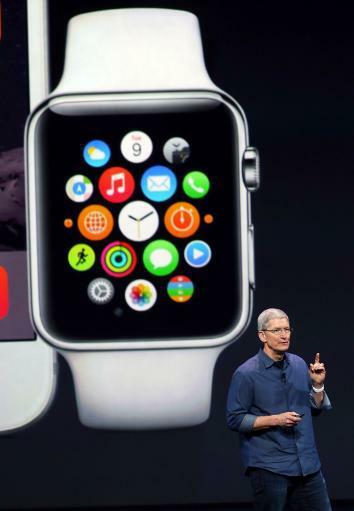 Apple CEO Tim Cook speaks about the new Apple Watch on Sept. 9, 2014. When Apple launched the iPad in 2010, it precipitated a long and surprisingly acrimonious debate about screens. Specifically, is it better to read from a screen that reflects light, as the Kindle does, or one that emits light, as the iPad does? In the end, as even Amazon realized, the difference was not enormous; what really matters is the resolution of the screen. Ink on paper is extremely easy to read just because it’s very high-res, and any device that can approach or replicate that resolution will also be easy to read. When the Apple Watch goes on sale next year, I suspect that the screen debate is going to return louder than ever. Only this time it’s not going to be about reading or resolution. Instead, it’s going to be about how glowing screens on people’s wrists inflict what economists call negative externalities on everybody else. I’ll admit that I’m particularly sensitive to sensory distractions. If you’re wearing a strong scent, it will give me a headache, and if there’s a TV screen behind you I will find it much more difficult to pay attention to what you’re saying. But then again, I’m only being human; we have evolved to be attuned to scents and to shiny moving objects. That’s why perfume and jewelry are such big business — and it’s also why strong perfume and ostentatious jewelry are considered déclassé. You know exactly what I’m talking about if you’ve ever found yourself in a movie theater with someone texting in the row in front of you. It doesn’t matter if they’ve set their phone to silent: that glowing screen is incredibly annoying to everybody nearby. A glowing Apple Watch will be just as annoying, and I doubt that theaters will be particularly successful in asking patrons to turn off their watches for the duration of a film or a play. Apple, and all other smart phone manufacturers, must make it very easy to turn on a “dark mode,” in which the watch is still on but the screen doesn’t light up. But realistically, most Apple watches are going to be in “light mode” nearly all the time. And that’s going to end up being a minor irritation to everybody in their vicinity. Not a huge irritation, to be sure. But it adds up. Your Apple Watch might be a wonderful gadget, for you. But it’s also going to make everybody around you just a little bit worse off. Which is one reason (there are others) why I’m not going to buy the Apple Watch when it comes out. Instead, I think I’m going to get a Withings Activité — a smart watch with a simple, elegant design that doesn’t emit any light at all. No battery anxiety, no complex operating system of taps and presses and twiddles to learn — and no negative externalities. It’s the polite smart watch, and I wish it the very best.